I’m pretty sure Pachamama reserves a special place in hell for people in Bolivia that “betray” their vegetable ladies. Two vendors at the 25 de Mayo market. It’s something so ingrained in the culture, that it never even crosses my mind to break this rule. If it did, it would probably make my stomach roll. You see, bargaining isn’t something that really happens in Bolivia, in the markets or otherwise. Okay, sure, they’ll give you three mangoes for 20 Bolivianos instead of 7.50 apiece, but deals don’t get much better than that. Nobody slashes prices temporarily to gain more attention or customers. Instead of giving discounts to encourage customer loyalty, market workers will give out a little bonus to customers who prove they are loyal to their vendors. This is called a yapa. 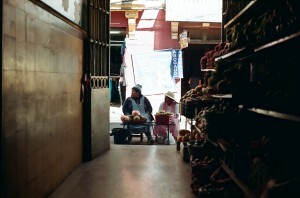 Bolivians also have a term for this idea of a habitual customer or vendor: caserito or caserita. The woman that I purchase vegetables from twice a week becomes my caserita, and I become her caserito. Hola caserito, there are bell peppers! If this happens, you’re almost certainly on the outside looking in. This is by no means a fragile system, but it’s one that becomes very ingrained into the way of life here. Your caserita gets a regular, loyal customer. She doesn’t have to beg and plead you to choose her over the likely dozens of other vendors selling the exact same food. And for that, she’s willing to toss in plenty of yapa to keep you coming back for more. Like I mentioned in my last post, most of these women work long hours and make little money. They really don’t have much to offer you. And the only real thing you can do to repay that to them, is to never purchase vegetables from another vendor. Ever.